Laptops are thinner, faster and more powerful than ever before. But in many ways, laptops haven't really changed all that much over the past few decades. The use is still the same as it was 20 years ago: a portable computer that lets you be productive at a desk, on an airplane or lying in bed. Some companies make laptops with screens that fold all the way back, but they're too clunky to be useful as tablets. Other companies make souped-up laptops that match the power of desktop computers, but they're heavy and not all that portable. 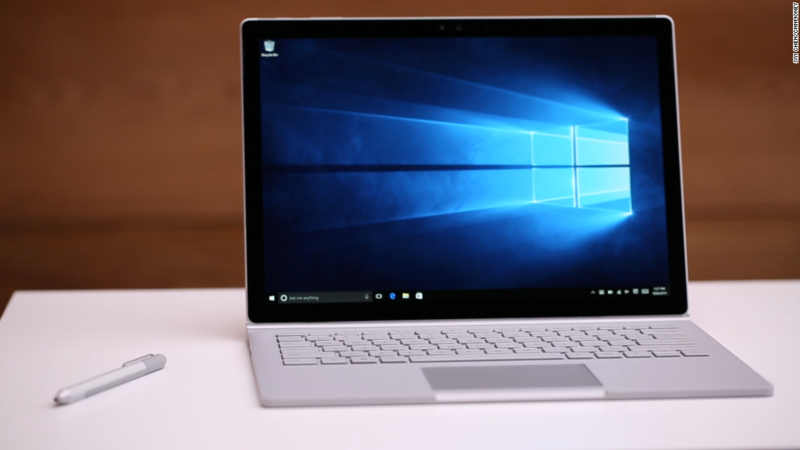 Microsoft's new Surface Book is different. It's a legitimately innovative gadget that could finally break the laptop out of its tired mold. When used as a standard laptop, Surface Book is crazy powerful -- if it's not the best laptop on the market, it's in the running. Its 13.5-inch screen has a higher resolution than the Retina display on the MacBook Pro. It's lighter, faster and has a better graphics processor too. And it's beautifully designed with a hinge that rolls out like a carpet when you lift up the screen. But unlike typical laptops, which put all the computing guts under the keyboard, most of the Surface Book's computing power happens behind its screen. That lets you use the Surface Book in three transformative ways. -- You can hold down a button to separate the screen from its base, transforming the Surface Book into a surprisingly lightweight and very powerful tablet. -- You can turn the screen around and fold it down over the keyboard, making it a canvas for an artist. -- You can pop the screen back into its base and take advantage of the powerful graphics processor and additional battery living under the keyboard. "Laptop mode" lets you do advanced video editing with a crazy 12 hours of battery life. "Our goal is to show people what can be done," said Panos Panay, Microsoft's design guru who leads the Surface team. "The laptop can be so much more than a laptop." Panay's team has helped transform the PC industry by inventing the uber-successful two-in-one category four years ago with the original Surface tablet. Since then, laptop-tablet hybrids have been the fastest-growing segment of the PC market. Microsoft (MSFT) has also released a new version of its successful Surface tablet. The Surface Pro 4 has an improved trackpad and keyboard, a better processor and a thinner design. But for all the success that Panay has had with the Surface, he says the Surface Book is his "favorite child." "This is my pride and joy," Panay said. "If it's not the best laptop anyone has created, we've failed." It's certainly wonderful to use, without a blip or lag. The Surface Book just flies, featuring the latest generation Intel processors and up to an enormous 1 terabyte (1,000 GB) of storage. It's gorgeous, too. The signature hinge is not just a conversation piece -- it's angled just right so that the keyboard never actually touches the screen, meaning your dusty keys won't leave an imprint on the display. When reversed, the screen is at a perfect angle for drawing with the Surface Book's digital pen. The hinge's coolest innovation is the "muscle wire" locking mechanism: When the screen is docked, an electrical charge tightens the wires to ensure an unbreakable grip. When you want to undock it, the charge is removed with a satisfying "click." There are a few oddities about the Surface Book. It's harder to open than most laptops, with a tiny fingernail notch that can be tricky to master. And since its screen holds a lot of the Surface Book's weight, it wobbles a bit, and the whole laptop rocks back slightly while on your lap. But those are minor issues. The Surface Book is Microsoft at its best, challenging its Windows-PC-making partners once again to rethink tired conventions. The Surface Book starts at $1,499. It's available for pre-orders now on Microsoft's website, and will go on sale in stores on October 26.